Set amidst the exceptional natural setting in the shade of ancient trees, la Coutelière is the perfect place to be at if you are looking forward to enjoy a fun camping time with your friends and family. The plot is huge and the atmosphere on the camp site is wonderful. The campsite also has access to the river which means that you can enjoy splashing around or even go fishing. The snack bar of the camping site is also very popular and is known to offer pizzas made on food-fired oven. 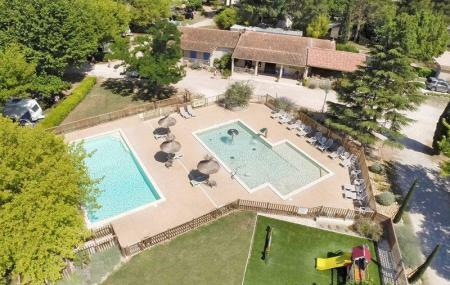 The facilities are truly top-notch and beautiful places like Avignon, lavender fields, Mt Ventoux, beautiful town of Gordes and much more are within easy reach from the site. Abounding of places like Amphitheatre D'arles, Musee De L'arles Et De La Provence Antique, Theatre Antique D'arles, Camargue Nature Park and Espace Van Gogh, city name has great things to do that are totally worth your time. Create a customized plan for your visit using the Arles trip planner. You can use ready templates or start from scratch for the same. You won't miss your home when in Arles, hotels in Arles like Best Western Atrium, HÃÃƒÂ´tel Arles Plaza and Le Cheval Blanc offer some of the best places to stay in the city. Generate executable plans on your own or book the top rated Arles vacation packages for your visit. Read more on how to reach Arles. How popular is Camping La Couteliere? People normally club together Epicurium and La Villa Augustine while planning their visit to Camping La Couteliere. Lovely place! Next to the river Sorgue where you can swim and feed the ducks. Nice atmosphere, new and clean bathrooms, shadow plots. Friendly service from the staff. In the heart of the most beautiful Provence villages and 30min from Avignon. Very nice and cosy place. Directly located at the river which very cold also in summer. Friendly and helpful staff. Rolls and Bread in the morning and pizza in the evening directly on the camping ground. The camping was full when we arrived, but the plots are large, so you don't feel crowded. The facilities are new and clean, the atmosphere is great on the camping. The river (Sorgue) is very clean, so bathing is a real pleasure. A place we'll definitely visit again. We stayed about 4 weeks with a caravan in Sept 2016 on this campsite and I can say everything here is almost perfect. There is another campsite in L'Isle-sur-la-Sourge (La Sourgette) were we stayed the previous time. Comparing both, La Couteliére is definitely the better site and the reasons are: 1. The sanitary facilities are much better and extremely well attended 2. The pitches are more shady and better, because on La Courgette you share a 4-party pitch with others 3. This campsite is run by a very nice family who care about everything, whereas La Courgette is a bigger and more formal in management 4. Here there is swimming pool (very much appreciated by many people) whereas Courgette has none 5. Last but not least: the snack bar has excellent pizzas homemade from wood-fired oven. So I recommend this place absolutely. Greetings to the family from Switzerland!